Most of you probably already know that your email list has the highest ROI of all marketing mediums. Adobe reported that the average ROI of email marketing is $40 to every $1 spent. For bloggers, the email list is the heart that pumps life into their posts and revenue into their pockets. The number one regret that I hear all the time from pro bloggers is always about their email list. They either wish they would have started capturing emails sooner or would have invested more time in optimizing their email list building process. I, too, have the same regret. I waited almost a year before I started building my email list on my blog. That year cost me about 40,000 emails and at least $100,000 in lost revenue. So, don’t be too hard on yourself if you are just starting out. The most important thing is that you start now and do it the right way. Since my email list is vital to everything I do, I have spent countless hours researching and testing every tactic known for building an email list. Today, I am going to share the eight email list strategies that consistently help pro bloggers build six digit email lists. Are you ready to make your email list explode? There are four locations on your blog that have proven to produce the most email subscriptions. Knowing where they are and how to use them is the first step towards building a huge email list. Exit intent technology allows you to have a popup that is completely unobtrusive. A popup using exit intent will only show up when the visitor moves their mouse towards the back button on the internet browser. After the popup, the next best location is at the end of the post. The visitors that have reached this point have shown they like your content. It is the perfect moment to ask them for their email. 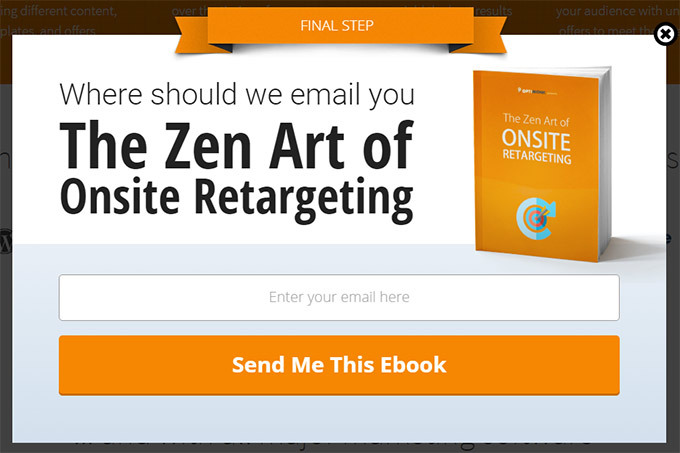 The popup and the end of post opt-ins will account for about 80% of all new email subscriptions. 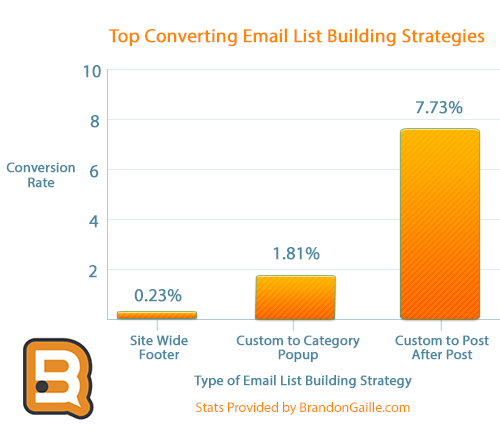 The footer is the third highest converting location for email subscriptions. Most email plugin tools will allow you to time the footer just like with the popup. I recommend setting the footer opt-in bar to rise up between 20 to 30 seconds after a new visitor has arrived to your blog. Since the footer only covers 50 to 100 pixels at the bottom of the browser, it rarely gets closed out like a popup. From 2000 to 2010, the top of the sidebar was the default location for subscribing to a blog. Those days are long behind us now, but it is still a nice location to ask for someone to subscribe to your email list. If you end up using all four locations, then remember to use a unique offer for each spot. Now that you know the four primary locations to place your opt-in… Let me tell you the three most effective tactics used by pro bloggers. Site wide basically means that you use one lead magnet for every page and post on your blog. This strategy works best with the floating footer. Since your space is limited, you will not have room to customize the lead magnet. Since my blog is focused on marketing, this call-to-action is relevant for every page and post on my blog. The major email opt-in plugins, which I will discuss later, allow you to create custom opt-in boxes for each category within your blog. I design custom opt-ins for the categories on my blog that receive the most traffic. This custom to category strategy works best with the popup. For example, I use a custom lead magnet that shows up when anyone views a post within the Slogans category. 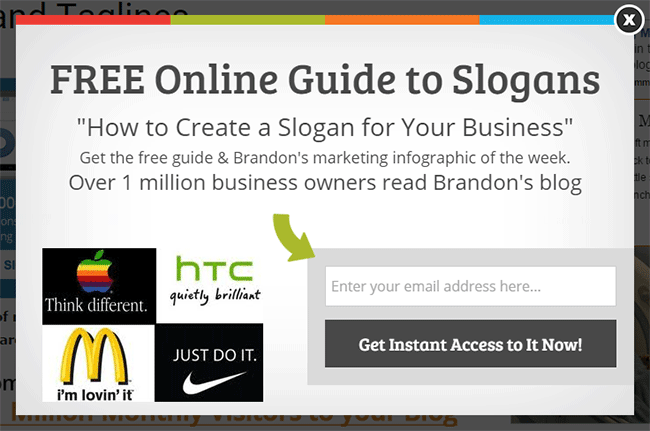 The lead magnet is a guide on How to Create a Slogan for Your Business. Whether someone just came to a blog post on real estate slogans or bakery slogans, the lead magnet is generally enticing to both. The custom to post opt-in has the highest conversion rate of any strategy, and the ideal location for this lead magnet is at the end of the post. Let’s quickly review the conversion statistics of the three strategies, which I have compiled from email subscription forms being shown to over 40 million unique visitors. The custom to post opt-in added 31 times more emails than the site wide footer. From a time perspective, it is much easier to knock out a site wide footer and a couple of custom to category opt-ins. Get those completed first. Then move on to creating custom to post lead magnets for the ten blog posts receiving the most organic traffic from Google. One more thing, all three of these can be used together, as long as each lead magnet is unique. 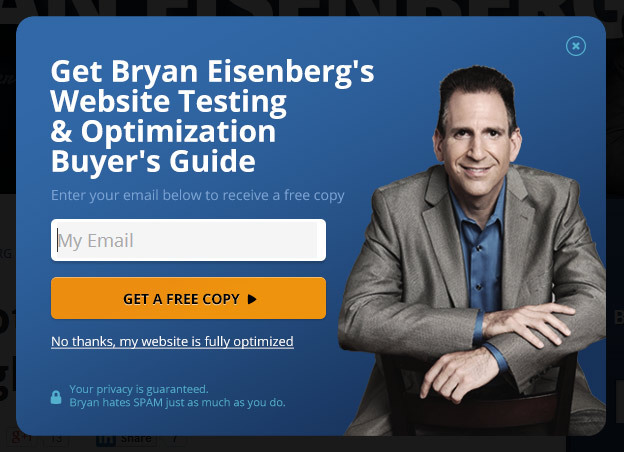 The design of your opt-in box plays a major role in your email subscription conversion rate. There are eight design tactics that pro bloggers use to maximize their conversions. 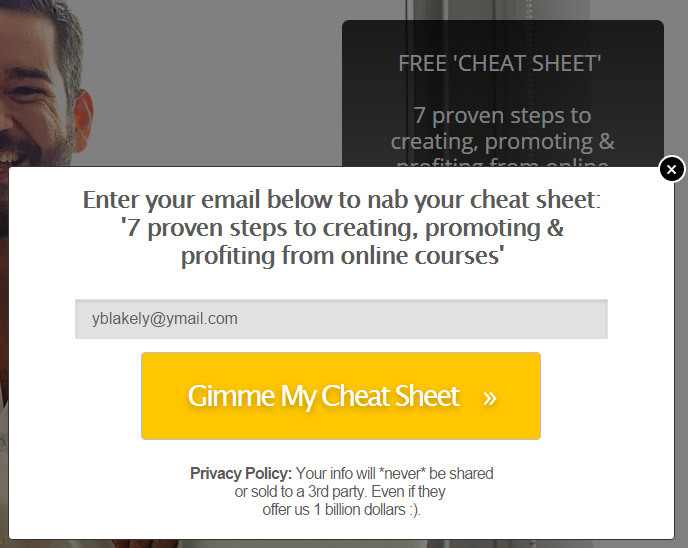 Popups – Since the popup is going to overlay the entire page, you can use a really large size to pitch your lead magnet. I prefer to use 450 pixel height by 700 pixel width for the size of my popups. I want to have enough room to make sure my headline and copy are big and bold. 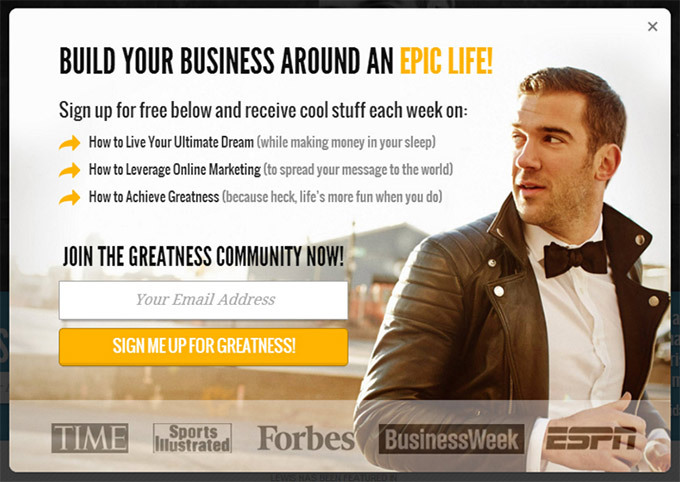 Lewis Howes does a great job of making his popups nice and large, and it makes a visual impact. After Post – There are two techniques that pro bloggers use in this location. The first is the large box, which will cover the entire width of your post area. Derek Halpern hits the size perfectly with his simple after the post opt-in. The second technique is the two step form. With this tactic, you create a smaller box that is clickable, and it opens a popup form on the click. Amy Porterfield has mastered this tactic, and she creates custom two step forms for almost every post on her site. Sidebar – Since you are limited on width, you will need to take advantage of the height to pitch your lead magnet. Try and make your height between 400 and 750 pixels. 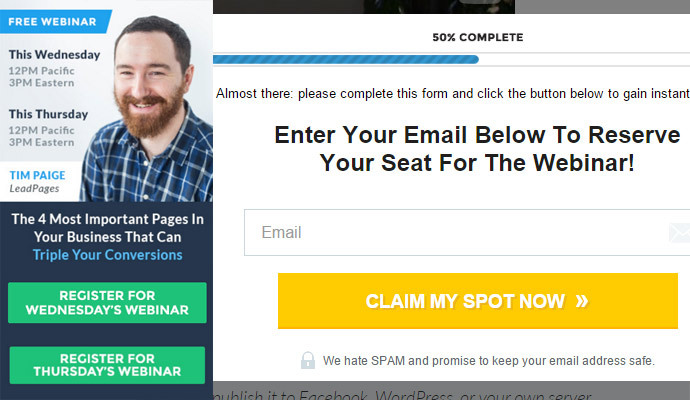 I really like how Chris Ducker uses a sidebar opt-in form to promote his 7 day bootcamp. His height is right at 725 pixels. The colors that you use on your email subscription box should match the emotion that you are trying to convey with your offer. Fast Company published the results of a research study that identified why companies use certain colors in their advertisements. Each of the eight primary colors stimulate different emotions, which can be leveraged to increase the conversion rate of your email opt-in boxes. The copy of your email offer needs to show them clear value, and it needs to be short and concise. It should also quickly tell them what your lead magnet will do for them. This will compel your visitors to take action. “Sign Up to My Newsletter” is the worst headline that you can use. This is unfortunately the most used headline on email subscription forms. Even if you just have a site wide email subscription form with no lead magnet, then you can still come up with a compelling headline based upon what tips you will be emailing them. Marie Forleo sums it up by saying, “Get Free Tips to Create a Business & Life You Love.” This phrase taps into emotion and conveys the benefit. Whenever you are writing the copy for your email offer try and use value terms. My favorite value terms are; exclusive, advanced, secrets, access, proven, special offer, and limited time. These terms will psychologically make people feel that they have to sign up. Brian Dean of Backlinko does an exceptional job of including several value terms in his headline and benefit statement. The right image will not substantially increase the conversion rate of your form, but the wrong image will destroy it. There are two types of images most pro bloggers will use on their email capture boxes. The mass majority prefer to go with an image of themselves. 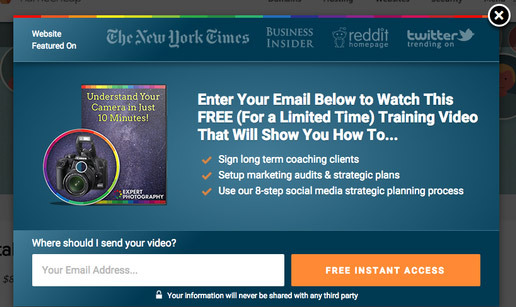 Michael Hyatt’s blog uses his image next to most of his primary email subscription boxes. The next most used image tactic is the book cover. OptiMonk uses a book cover to compliment their headline and convey the depth of their free guide. The SumoMe study, that I mentioned earlier, compared the effectiveness of the four most used colors for buttons, which are red, green, yellow, and orange. The results revealed that the colors red and green had the highest conversion rates. Forms with the red button collected 20% more emails than forms using the green button. The reason why is because we associate red with stop. Most email forms are not part of the natural flow. The contrasting red button makes visitors subconsciously stop to read the surrounding text. Ascend2 surveyed the top email list growth experts and found that the average number of fields used on subscription forms was 2 to 4. Over 60% of the people surveyed preferred to use 2 to 4 fields. The science behind using a short form is real simple. The conversion rate of a form will drop by 20% for every form field that you add. I recommend using a maximum of two form fields. One for their name, and the other for the email address. Another common mistake that newbies make is using the default text of “Submit” for the button text. Try and use some creative action words that will drive them to click the button. A case study by Conversion Voodoo identified that having inline text that reads “Enter Your Email Here” increased email signups by 36%. The inline text is the text that appears within the form fields. Once you have over 1000 subscribers, you should let people know about it on your email opt-in forms. This will give you another bump of 10% to 20% on your conversion rate. The CoSchedule blog takes this a step further by pairing their total number of subscribers with a testimonial from a subscriber. Whenever you are creating the content for your lead magnets make a concerted effort not to go overboard. A 400 word list of resources will convert just as much as a 50,000 word ebook. Because the 400 word list of resources only takes five minutes to read, it will also get read almost 100% of the time. Whereas, the 50,000 word ebook will be read only 20% of the time. No matter which type of lead magnet you decide to use, center your attention on delivering the nuts and bolts in a concise manner. This gives your new subscribers a quick win, and it makes it easier for you to create your lead magnets in less than 30 minutes. There are seven types of lead magnets that consistently get the highest conversions for pro bloggers. The toolkit is a simple list of resources or websites. This is one of the easiest lead magnets to create content for. Just make a list and write a 2 to 3 sentence summary for each resource. Always check to see if any of the websites on your list have an affiliate program. If they do, then sign up and add the affiliate link to your list. The cheat sheet or checklist is just a list of steps or action items. That is it. A guide is going to require a little bit of research, and it will generally call for at least 1500 to 2000 words of content. The industry report lead magnet works best when your blog focuses on a specific B2B niche. You will need to survey your audience and create some nice graphs to expound upon. The best way to create video content for lead magnets is to do screencasts. Just record your screen while you perform specific tasks that people are interesting in learning about. Webinars are the most effective way to sell your courses, products, and services. They are also one of the highest converting lead magnets. The down side is that it takes some time and money to execute a webinar at a high level. Free courses can take anywhere from 40 to 120 hours to create. If you have a paid course, then a free course is a great way to get them into an autoresponder sequence. A free course usually has at least 3 hours of video content broken into 4 to 15 video modules. There are three tools that I consistently see pro bloggers using to create their email forms. I have used all three of these, and they all work great. This is a WordPress plugin offered by Elegant Themes. It costs $89 per year, but you get access to their other 5 plugins and 87 themes. This includes the Monarch social sharing plugin, which is the floating bar on the left side of each of my articles. This WordPress plugin is my favorite out of the three listed here. It is real easy to use and customize. The price starts at $49 per year. I use the $199 per year package that includes the exit-intent technology. This is the Ferrari of lead capturing tools, and the pricing starts at $25 per month. LeadPages has the widest selection of templates to choose from. They also allow you to capture emails via text messaging, which works great for podcasts. To make this real simple.. Let’s take a look at a study by MailChimp that compares the single opt-in to the double opt-in. In regards to open rates, MailChimp found that double opt-in lists had nearly double the amount of unique opens as the single opt-in lists. As far as click rates go, the double opt-in lists had slightly more than twice the click through rate as the single opt-in lists. The basic math tells you that a single opt-in form will need to capture twice the amount of emails for it too make any sense to use. In my experience, a single opt-in will capture between two to three times the emails as the double opt-in. So when does it make sense to use the single opt-in? Well, there is really only one situation, and it is a common one. If your opt-in confirmation email goes to the promotion tab in Gmail, then you will be better off using a single opt-in. Gmail will account for 40% to 60% of all of your email subscribers, and none of them will take the time to look in their promotion tab. With that in mind, there are only two major email marketing service providers that allow single opt-in email lists. I have accounts with both of them. MailChimp has the best free package out of the two. You will get to use their service for free until you surpass 2000 emails. They also have one of the most user friendly email builders in the industry. These guys also offer a free package, and it allows you to try their services for 60 days before you get billed. If you are setting up your email capture for the first time, then I recommend using Constant Contact. There entire user interface is designed for beginners, and it makes it real easy to get going out of the gate. Both MailChimp and Constant Contact are plug and play compatible with Bloom, OptinMonster, and LeadPages. If your confirmation emails are going straight through to the inbox, then you should be using a double opt-in. Your list will end up being half the size with twice the engagement of a single opt-in list. This will cut your email marketing costs in half, which will get into the hundreds of dollars per month after you surpass 25,000 email subscribers. Brian Dean of Backlinko increased the conversion rate of his email list by 25% just by optimizing his email subscription confirmation page. His confirmation page asks news subscribers to go confirm their email right away, and he explains exactly how to do it with a nice visual. Ramit Sethi ups the ante by including a countdown timer on his confirmation page. In addition, he uses negative psychology by letting them know three pieces of content they will be missing out on. There are essentially two major philosophies on how to deliver the goods that your lead magnet promised. This strategy makes the user go to their inbox to retrieve the link to the content. This works best with double-opt in lists because it forces them to complete the opt-in confirmation in order to get what they want. If you are building a single opt-in list, then you will want to send them straight to the content. With a single opt-in, there is no benefit to making them go back to their email to find the link. By sending them straight to the content, you will make them happy and guarantee that your content gets seen. This is especially important when your content is part of a sales funnel that generates revenue. From 2004 to 2011, almost everyone placed their lead magnet content in a PDF format. Over the past couple of years, there has been a big shift towards placing the content into a standard blog post. There are three reasons why a blog post is better than a PDF. It is Faster and Easier to Produce – To create a PDF, you will need to use design software that requires some knowledge to execute with excellence. A blog post can be completed in about one third of the time it takes to create a PDF. It is Responsive to All Devices – PDFs have a way of not showing up correctly on mobile devices. Since 40% to 60% of all blog traffic is mobile, it is best to create the content through a blog post with your existing responsive theme. It Can Be Leverage for SEO – By creating your lead magnet content in blog posts, you will be generating more organic traffic from Google. When was the last time you did a Google search and saw PDFs dominating the first page of results? The bottom line is… you want to use the simplest process that gets the best results. Do not over complicate things by trying to create PDFs when a blog post will give you the ideal outcome. Your welcome email is the first real email communication that your subscribers will receive from you, and you need to make it count. Super Office published the results of a large study on why people open an email. The sender name and subject line were the two clear triggers that led to an email being opened. Your from line needs to be consistent with your blog or your name. If you have a personal branded blog like mine, then you will want to use your name. I use Brandon Gaille in my from line instead of BrandonGaille.com. I tested these two against eachother and found that Brandon Gaille received 10% more opens than BrandonGaille.com. For those of you that do not have a personal branded blog, you should test your personal name against the name of your blog. It will usually depend upon how much your personal profile appears in your blog. If you are the sole writer and your about page is all about you, then it makes more sense to use your personal name in the from line. Your subject line should highlight the most valuable piece of content that you will be sharing in the email. You should never use generic statements like…Thank You For Joining or Welcome to My Email List. My most valuable piece of content in the body of my email is a link to my about page, which shares my battle to overcome the disabilities from a brain tumor. The subject line for my welcome email is, “From Brain Tumor to 1 Million Visitors.” This subject line compels them to open and click on the link that I want them to click. The length of your subject line also plays a role in getting your welcome email opened. Retention Science found that subject lines that had between 6 and 10 words get opened the most. I prefer to break the body into short three short paragraphs. Thank you and Expectations – I start off by thanking them for subscribing. I also let them know what to expect from future emails, which includes the main topics and frequency. Who I Am – In the second paragraph, I quickly state my experience and what makes me the expert. The last sentence has a strong call-to-action promoting my about page with a clickable link. My Services and Products – The final paragraph quickly mentions my top service and product. The people that sign up to your email list are ideal candidates for your services and products. If you keep it simple and do not over sell, then this paragraph fits in perfectly. The signature is the last opportunity to impact your new subscribers in the welcome email. The most important component of your signature is the picture you use. Make an effort to find a picture that shares more about yourself and your personality. If you have a family, then let your subscribers see them. You can also highlight your pets or hobbies in the photo. 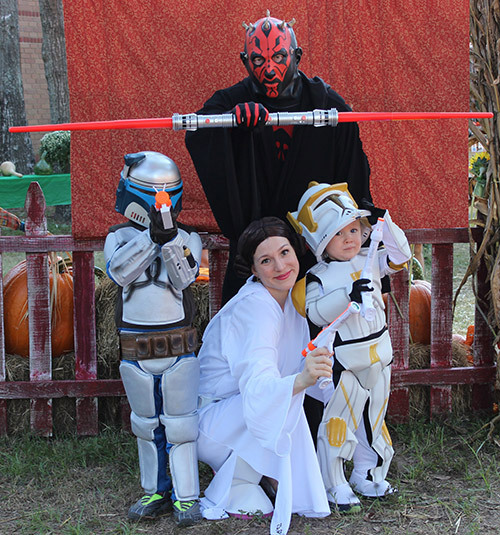 I use a Halloween photo of my family where we are all dressed up as Star Wars characters. Instead of utilizing overused words like “sincerely” and “thank you,” I close my email with..
One thing to remember is to make sure your signature image width is 300 pixels. Almost 50% of all emails get viewed via mobile phones. A 300 pixel width image will look great across all devices. That wraps up all eight of the list growth strategies that are used by pro bloggers. Take ten minutes right now to create an action plan for adding these strategies to your arsenal over the next 30 days. Your email list is your most valuable asset, and you need to do everything in your power to make it is grow as fast as possible.